I am gradually making a few changes to update our family room/ kitchen/meals area. Anna, from Ethos Design has given us some great ideas for modernizing our room. As you may recall, we are introducing some seafoam/turquoise and white into the room to freshen it up. We have ordered a few items, including fabrics for new table runners and cushions. One project I could get started on straight away was a Wooden Tray Make-over. 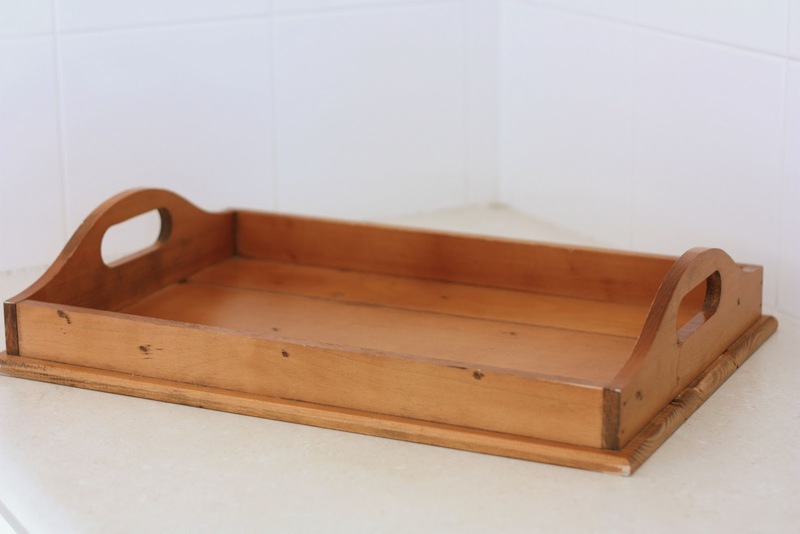 I had an old pine wooden tray, purchased for a previous home that had a country cottage kitchen. I lightly sanded it, and then used a can of white gloss spray paint to brighten it up. It brings a brighter colour to our Tasmanian Oak coffee table and also provides the perfect space to corral a few accessories. The spray paint cost $2.95 so it was a budget friendly recycling project. 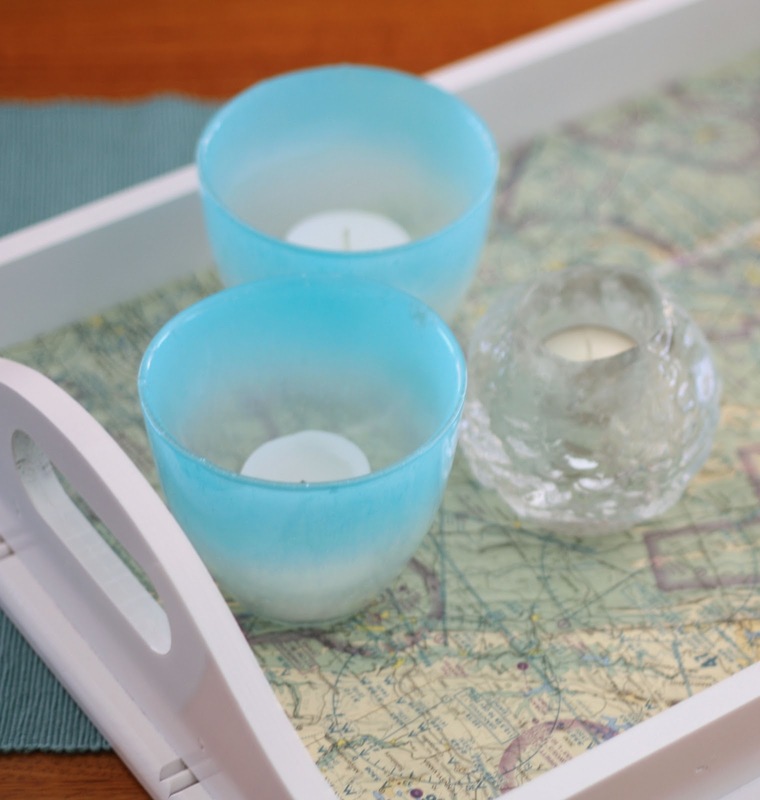 I lined the tray with an old aeronautical map, that was cut to size. I decided against decoupaging it, in case I want to change it around later. 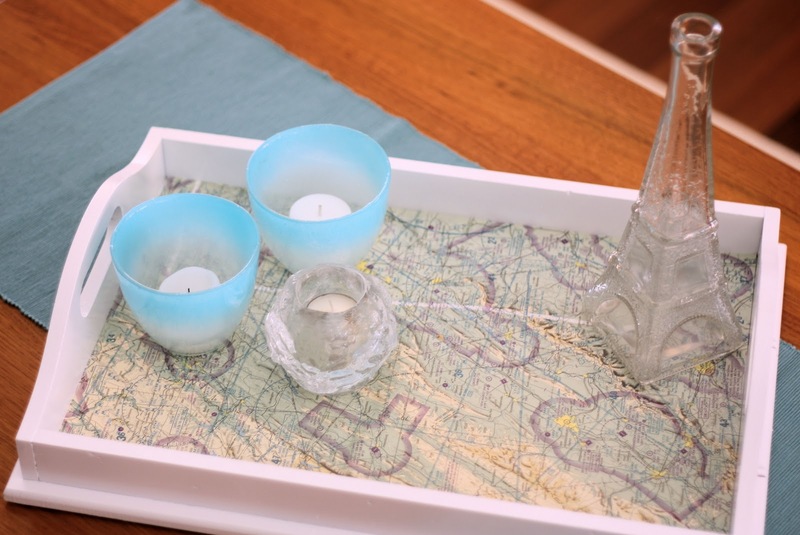 The map was ironed to smooth out the creases, and then attahced with masking tape to the bottom of the tray. The map fits in with our travel theme, and the blue/green colours are perfect. 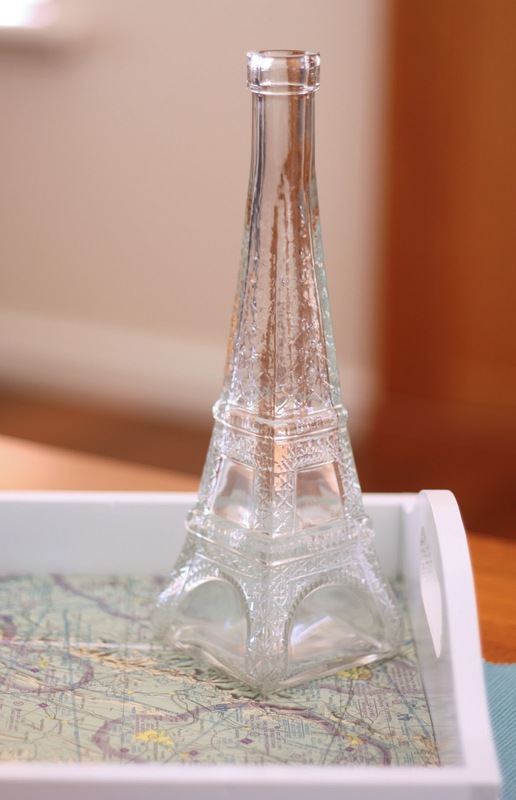 I have added some aqua candle holders, and an Eiffel Tower bottle (purchased from Bed Bath and Table). I am so happy with how it looks. 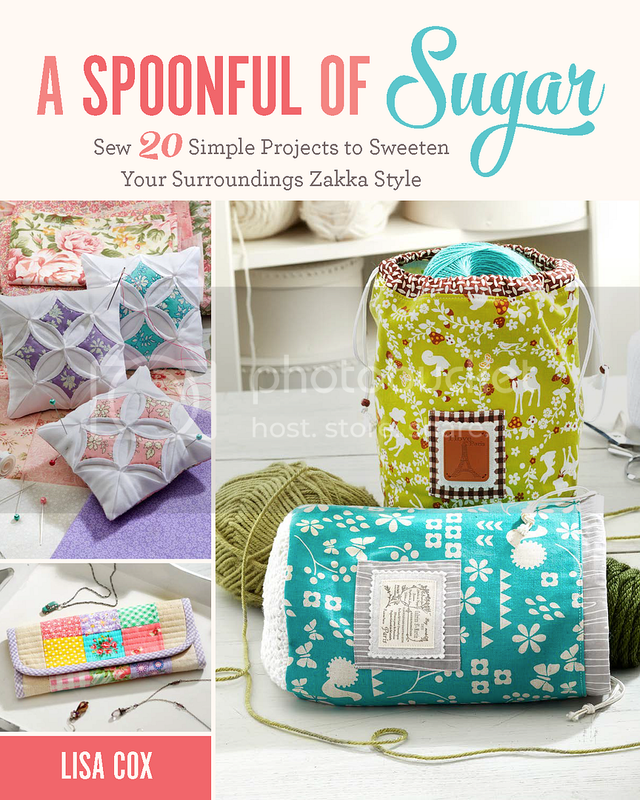 I can’t wait until my fabric arrives so I can get started on some soft furnishings. Hope to have some more room updates over the coming weeks. Oh I LOVE your tray- it looks really good! 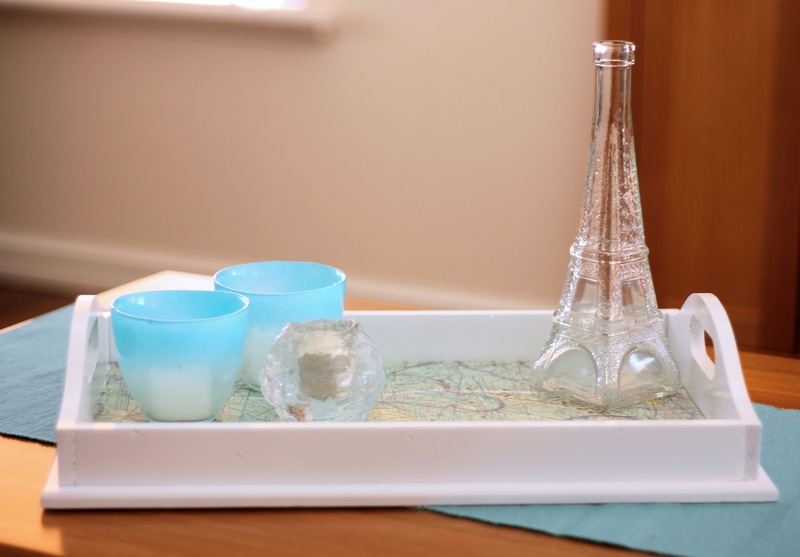 I might just borrow your idea- I have a blue tray I never use anymore…. I love this! What a great project! This is a great way to liven up an old item, and coordinate with you new theme. I love the crisp whiteness of the tray. I love maps and travel themes so the map is a perfect addition. Fun to update your decor with simple projects like this, isn’t it. I have a collection of wooden trays that I was saving. This will be the perfect project for them. Thanks for the ideas.